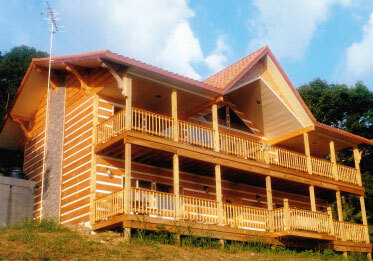 Our “Le Chalet” cabin is 3 stories tall, 2 bedroom, 3 bath, and sleeps 9 comfortably. As you walk in at street level, there is a large bedroom with 2 double beds and full bath. The utility room with washer & dryer complete the first floor. Up the stairs brings you to your 2nd, or main floor. Primarily designed for entertainment, the Main floor contains a LARGE kitchen with plenty of counter space! The dining room table will seat 10 guests. The Living room has a queen sized futon sofa, plus a single sofa, & pull out single sleeper. The TV in the living room has a DVD player, along with a few local channels. A full sized bath is just off the kitchen. Your covered deck out back has a gas grill and large Hot Tub. Your campfire pit, plus wood / charcoal grill are just a few steps away in your back yard, with a great River view! The 3rd floor ‘open’ loft has a queen sized bed and full Bathroom. This is an absolutely ADORABLE cabin! Everything is provided, all you need is food & drink. 2016 PRICES; WEEKDAYS: Monday – Thursday $215.00 per night for the 1st two people. Additional guests are $13.00 each per night. WEEKENDS: Friday – Sunday $225.00 per night for the 1st 2 people. Additional guests are $13.00 each per night. MAJOR HOLIDAYS: $240.00 per night for the 1st two people. Additional guests are $16.00 each per night. THERE IS A 3 NIGHT MINIMUM ON HOLIDAYS. THERE IS A 6 PERSON MINIMUM ON HOLIDAYS. Welcome Friends to “Le Chalet”! Please, come inside, and leave your worries and cares outside the door.”Le Chalet” is a 3 story, 2 large bedroom, 3 Full Bath ENTERTAINMENT CENTER for the entire family. Entering at street level brings you to your first bedroom. Two double beds, a laundry room and full bath make the livin’ easy. Upstairs the main floor is laid out with a Large Living Room, boasting a queen sized “Lane” sleeper sofa, PLUS a “lane” single sized sleeper loveseat. A 24″ TV with build in DVD and VCR. ONLY ONE REMOTE! The large kitchen and 10 person kitchen table begs to entertain that Christmas or Thanksgiving Holiday Dinner. 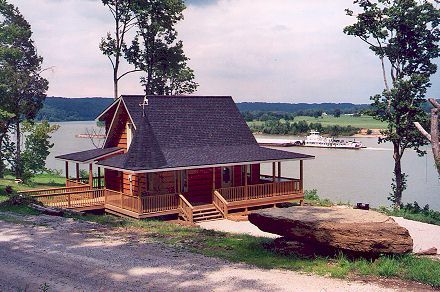 Your front porch faces our mighty Ohio River with rocking chairs and cedar porch swing. Your Private and Secluded back porch holds your large gas grill and a 5-7 person hot tub!! INCREDIBLE river scenes from the plush and comfortable Loft Bedroom. Another Queen sized bed and full bathrooms, and you know that this little slice of heaven is just what you and your family deserve. Please visit us at the River’s Edge in our newest log cabin, “Le Chalet”. ENJOY!! Hot Tub & Gas Grill is on your Back Porch! The stairway leads to the fire pit and campfire seating.